The Ignosaurus (Latin: Ignosaurus Status Quo) is a beast that lurks in the shadow of Marketing. Some say it doesn’t exist. That it died out millions of years ago along with the other dinosaurs. Some say it never existed. But insiders know the dirty secret… that the Ignosaurus is very much *ALiVe* in marketing. It lurks in our industry—holding you or your teams back, bringing everyone down. The only way to slay it…? Take away its seat at the table and invite another creature in its place. This is a lightly edited transcription of my keynote at the MarketingProfs B2B Forum, illustrated by a few of the slides. This morning let’s talk about slaying the Ignosaurus—what it is; why we need to slay it. 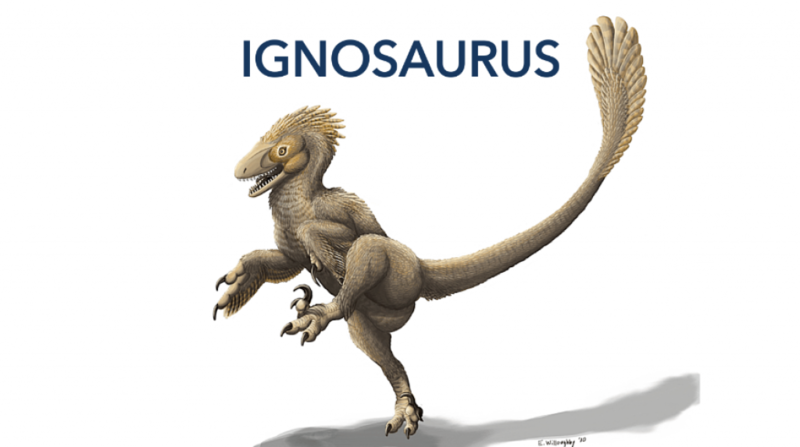 You paleontologists in the room know that Ignosaurus is short for Ignoramus-Status-Quo. Some say it doesn’t exist. That it died out millions of years ago along with the other dinosaurs. Some say it never existed. That it’s nothing but a myth. Like the Loch Ness Monster. Or Bigfoot. Or elections in Florida that go off without a hitch…. But those of us insiders here in San Francisco know the dirty secret: the Ignosaurus is very much ALIVE in B2B marketing. It creeps about in our industry—holding you or your teams back, bringing everyone down. Working with it is flat-out miserable. We B2B marketers recognize its anatomy well. It has a glassy-eyed, unfocused stare. That stare is because the Ignosaurus is an order-taker going through the motions. It has zero engagement on the job. It shows up at work. It opens its mail. It starts responding. It’s bored. But who cares… it’s a job ya know? In fact, almost half of us—43% of us—say that our day is always or frequently based on what we find in our inbox when we get to work each morning. This is according to a brand new MarketingProfs study that we’re unveiling today, at this event. How does this play out in Marketing? The result for us B2B marketers is that our day is ruled to a large degree by our inbox, which keeps us in reactive mode… all….day…. long…. It means we have no control over our work lives. It means we go through the motions of fulfilling orders vs. actually taking control. Maybe you see this in your teams. 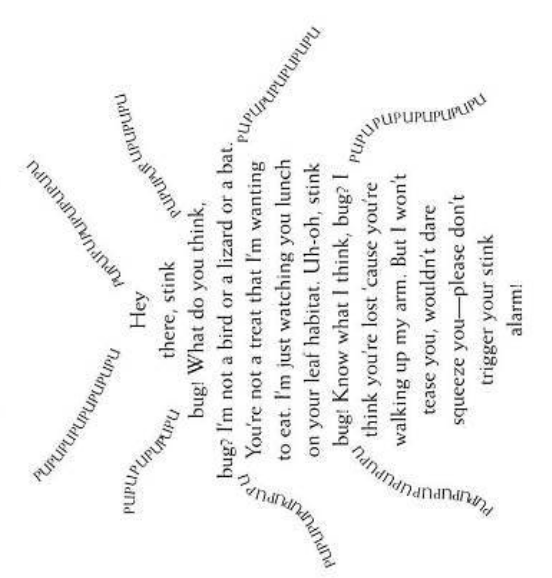 Maybe you experience this within yourself. We didn’t go into marketing to be order-takers. But some days it feels like that, when all you do all day is check boxes and fulfill requests made by other people. You know that guy behind the deli counter at the grocery store….? That is too often scarily like B2B marketing. The second way to recognize the Ignosaurus is by the talons that aggressively clutch onto the Status Quo. The Ignosaurus doesn’t want B2B marketing to experiment. It’s not curious about new tools or new techniques. It lacks curiosity completely. It doesn’t want to make changes. It’s lazy. But it’s also arrogant. It ignores every shred of data that shows how marketing needs to evolve. Study after study has shown that Marketing has one of the most pronounced skills gap of any industry. Many of us feel that we don’t have the skills we need to produce our best work. A recent study by Grovo bears this out. Grovo found like 90% of us consider ourselves under-skilled in digital marketing. 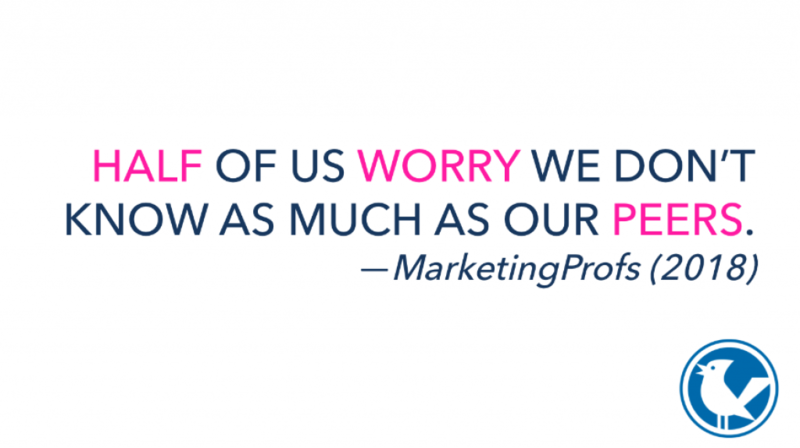 At MarketingProfs, we found something similar: Half of us worry we don’t know as much as our peers. We fear we are being left behind. So what does the Ignosaurus do…? It maintains the status quo. It doesn’t see an opportunity to level up. It does what it’s always done. It puts in ZERO effort to experiment, to attempt new things. Because the Ignosaurus is seriously unmotivated. Finally, let’s talk about that thick hide. It’s thick like … UPHOLSTERY. With double Scotch-Guard. That thick hide is waterproof and resistant to change of any kind. It doesn’t absorb anything. It lacks any kind of vulnerability—it thinks it already knows everything. Everything rolls right off it—new ideas, new thinking, new strategies, new approaches, responsibility for its own future. Whatever. Ignosaurus don’t care. It’s happy just putting one big ugly foot ahead of the next. The world is moving on without him. And that’s alright by him. It results in bad marketing. It gives marketing a bad rap. It’s random acts of content. It’s spaghetti against the wall. It’s whatever cliché you can think of…. Sometimes the Ignosaurus lurks in the darkest corners of our organizations. Sometimes you work for him. Or sometimes maybe a tiny little part of yourself is the Ignosaurus…? Whatever the case… it needs to go. So what is its kryptonite, its wooden stake through the heart…? How do we take away its seat at the table? It turns out that there’s only one thing that can slay the Ignosaurus – there’s only one creature powerful enough to defeat it. And it’s not with violence, but with brains. The only thing that can slay the Ignosaurus is the Knowledge-Pegasus. by surrounding yourself with curious and engaged people. And if you are leading a team: To make sure that the team has access to all that, too. Why can’t we just continue to give the Ignosaurus a double-wide chair at the table? Why do we need to Slay the Ignosaurus right now, more than ever…? It’s because B2B marketing is at a crossroads. Marketing has changed. Never before have we had access to such a vast and wide new field of tools, new technologies, new ideas. Never before has marketing required so many new skills. Never before has so much been expected of all of us. (And by the way, I’m talking about Marketing here. But I also think the world is at a crossroads. In an era of Fake News and Spin and the word-of-the-year Misinformation… never has it been more important to take control of our own education. Never has it been so critical that we lead and educate ourselves. Ignorance is the path to extinction as a marketer. Not taking control of our own learning opportunities (or that of our teams) is the fastest way to make yourself irrelevant. And I say this with love in my heart… But marketers: Right now, we are failing to slay the beast. Our industry itself is failing to slay the beast. This is why 90% of marketers feel they are lacking in digital marketing skills. And this is why 50% of us feel like other people know more than we do. Nobody is like: I don’t want to level-up. I want to be a beast. An order taker. Here’s the math: Nope percent of people would choose to be an Ignosaurus. But it happens if we aren’t staying in an Always Be Learning Mindset. So are you doing enough on a regular basis to give yourselves the skills you need? CMOs and marketing leaders: Ask yourself – are we investing enough in training our teams to be ready for the future? If you’ve brought them to this event, chances are you get it. But what happens when we get back to the office? Next week? Next month? Do you have the right programs in place to Slay That Beast? Have you adopted that Always Be Learning mindset? You’re here because your company understands the value of learning. 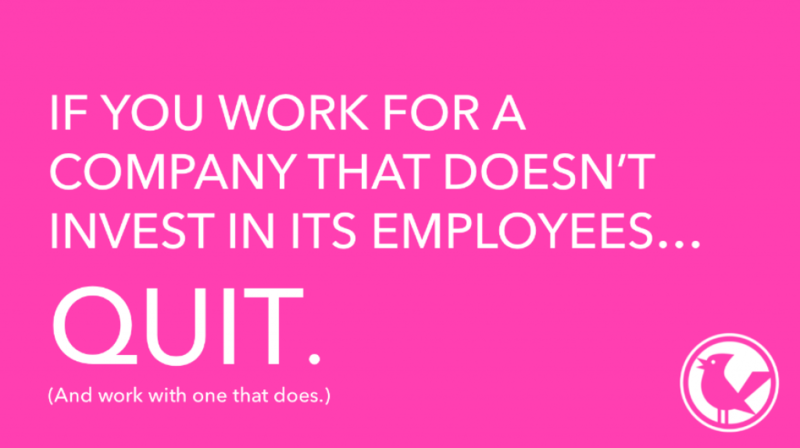 Any marketer who doesn’t work for a company that invests in them should Quit. Get out. Find a place that DOES value learning. This is my call to action for all of us to support ourselves and our teams. It’s the only way marketing will continue to grow and thrive. Not just once in a while. Every day. Bain and Company found that there’s a difference between satisfied employees – who have the tools to do their jobs – and engaged employees – who feel like they’re growing every day. The goal is to provide opportunities all the time to learn to grow as professionals as marketers. This is something we are passionate about here at MarketingProfs. In September we re-launched our website and retooled our products to bring our commitment to education front and center. MarketingProfs has a long history focused on marketing education. We were founded in 2000 by University Professor Allen Weiss. Since then, we’ve always believed that learning is the key to success. Since 2000, we have educated literally thousands of marketers through thousands of programs. And now, we’re redesigned how you engage with our training, to make it more flexible and accessible to you. We have a new set of on-demand training courses as well as a new set of in-person workshops – things that can help you continue your learning long after we’ve all left B2B. And while marketing education is what we are all about, we’ve also come to believe something bigger, more central and more important to us all: That learning of all kinds is essential for health and human happiness. Not just Marketing learning – but all kinds of learning – which is why part of our new mission is to tell stories of people whose lives have been transformed by things they learned – both professional and not. Release the grip on the status quo– bring your curiosity into every session. Make one new friend. Surround yourself with equally curious people. And especially because we are here in San Francisco, where many people are struggling, let’s all try to find an opportunity to do one kind thing for a stranger. To that last point: We can’t control the events around us. But we can make our corner of the world a better place. And when you go home, continue to feed that learning. This fall, all of us at MarketingProfs have been setting aside 5 hours a week to dedicate to learning something new… how about you, too? So let’s do this – let’s slay the Ignsaurus and give the Knowledge-Pegasus a seat at the table. 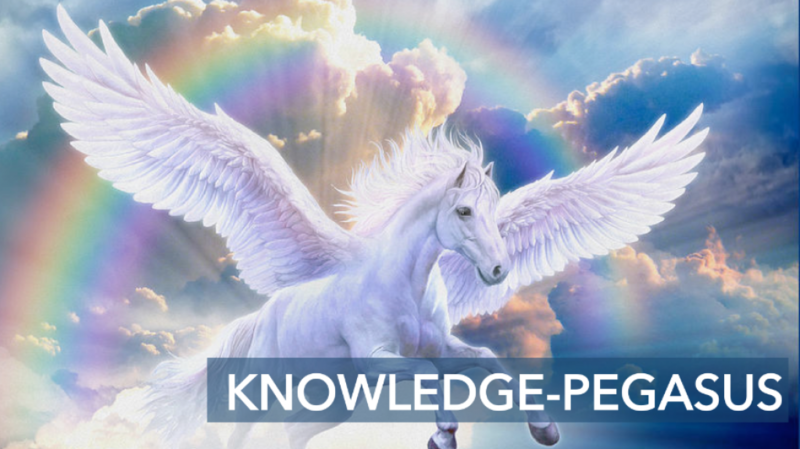 And let’s do it together… because the ONLY thing more powerful than the Knowledge-Pegasus is…. 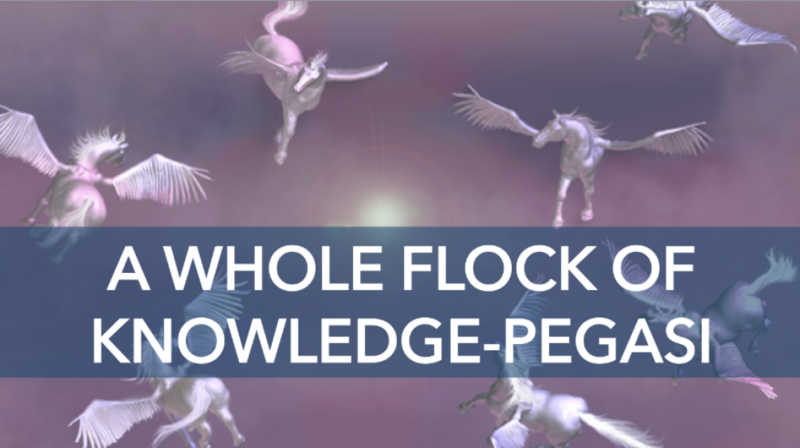 a sky full of Knowledge-Pegasi! Download the MarketingProfs Marketer Happiness Study here. Join us next year at the MarketingProfs B2B Forum. We’re coming back to the East Coast! You remind me of my mother and the best coaches and teachers I’ve had. All of them were constant learners. My wrestling coach at San Jose State always introduced us to new techniques and coaches from his travels. As ancient as wrestling is, he found ways to incorporate and innovate (props to coach TJ Kerr). Great presentation!